KANSAS CITY, Mo. 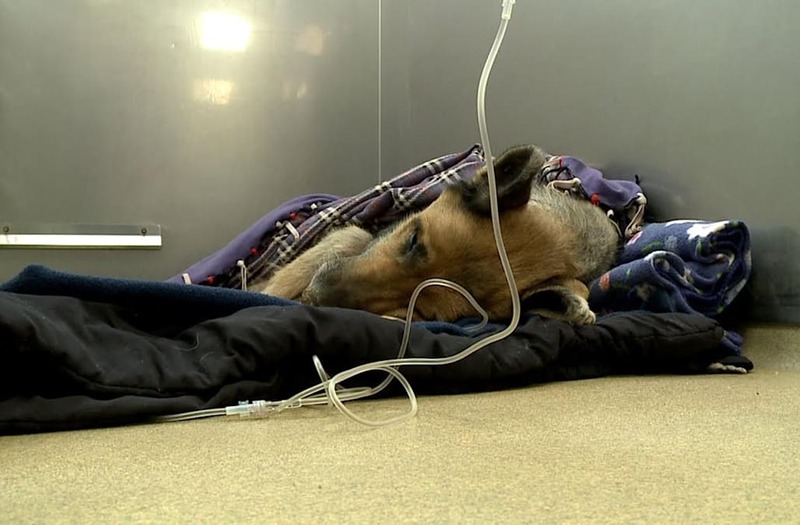 (WDAF) — An update on Caesar, the German Shepherd brought to an animal clinic on Monday suffering a multitude of ailments and nearly frozen to death, brings a bit of good news. Nancy Campell with Missouri German Shepherd Rescue has been working with Caesar, said on Tuesday the dog was already showing small signs of progress. Caesar's caretakers said his progress was "good, and we remain guardedly optimistic." Campbell said he is more alert, but still sleeping 20 hours or more a day. She said with support he is able to walk, limping on his one good back leg and is sometimes "toe touching," meaning he is letting his bad leg touch the ground. Although he can not bear weight on the leg, his ability to move it slightly and allow it to touch the ground is a positive sign for the future. She also noted that the swelling in his good leg has gone down about 20 percent, and she's hopeful it will continue to go down. Caesar's veterinary staff will continue to monitor his progress.